The lights go down at the start of IPSA DIXIT, a substantial new work by Kate Soper, a composer, soprano, and co-director of the New York new-music ensemble Wet Ink. Three performers – Wet Ink colleagues flutist Erin Lesser, violinist Josh Modney, and percussionist Ian Antonio – enter soberly. Soper arrives last, mounting a low platform amid the players, atop which she stands framed by a gauze-covered window. The room hangs in anticipatory suspense. But Soper looks vexed. She descends from her perch, and approaches the audience. “What is art?” she asks. 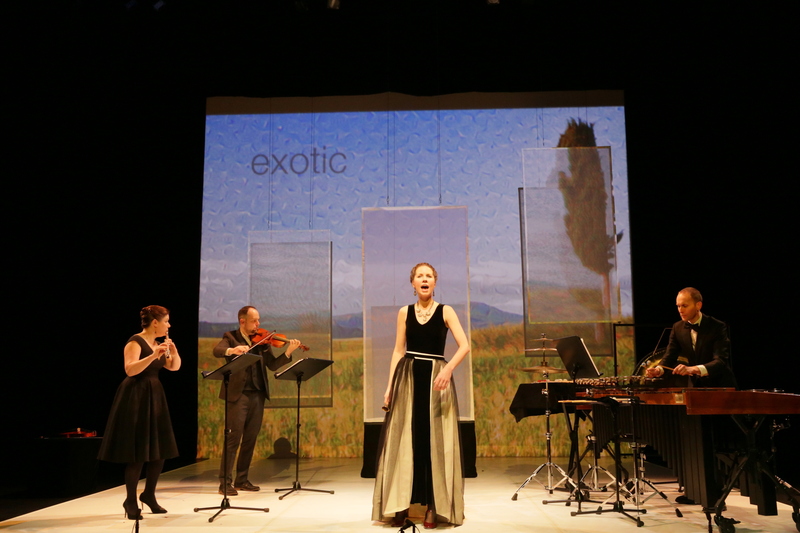 An evening-length work of theatrical chamber music that explores the intersections of music, language, and meaning through blistering ensemble virtuosity and extended vocal technique, IPSA DIXIT blends elements of monodrama, Greek theatre, and screwball comedy to skewer the treachery of language and the questionable authenticity of artistic expression. All accurate enough, and wholly in keeping with the abundant creativity, learned intellect, and inquisitive drive Soper revealed in earlier works like Voices from the Killing Jar and Here Be Sirens. Adapting texts by Aristotle (repeatedly), Sophocles, Plato, Ludwig Wittgenstein, Sigmund Freud, Lydia Davis, Jenny Holzer, and more, Soper presents a variable treatise on art and its available meanings, one as clever and sly as it is erudite and provocative. But instantly, the musical conversation – and as often as not it’s exactly that, given Soper’s demands on her instrumental accomplices to verbalize, to engage in theatrics, to deliver lines outright – suggests some nuances she clearly intended, along with others she likely could not have foreseen entirely. Her title is a feminized version of ipse dixit, a Latin phrase meaning “he himself said it,” underscoring the creator’s authority. But her initial action, as staged by director Ashley Tata, runs contrary. Soper takes the stage last, a privilege shared by a work’s creator and by the archetypal vocal diva, but then dismounts her perch immediately to assert herself as one among equals as she intones words that in fact are not her own, espousing sentiments and positions adopted from others. As a legal term, ipse dixit literally is defined as “an unsupported statement that rests solely on the authority of the individual who makes it.” Seated in a concert hall, we audience members already have recognized and endorsed Soper’s eminence; why else would we attend? She also presses us to contemplate the primacy of a singer’s stage presence relative to that of her instrumental accompanists, a status that Soper – not a singer who composes, but a composer who sings – seems eager to explore. When we mull that specific bit of legalese at this particular moment, though, how can we not also think of a President who wages war with the conventional media with blunt, frequently inaccurate statements on Twitter that nonetheless benefit from the gravity of his station, and whose spokespeople use their own positions of authority to disseminate what they euphemistically term alternate facts? Those specific considerations, however, seem unrelated to the essential thrust of Soper’s piece: a dazzlingly varied six-part sequence of quartets and duets spanning a stylistic range best described as broad and eclectic, but never unapproachable, employing texts concerning matters of intellect and sentiment, cognition and persuasion, perception and awareness. Yet she punctuates her delivery using a bell with no clapper, its sound produced by Antonio. Voice and instruments likewise might play against character, while a realistic background image gradually grows pixelated and blurry. Similar intellectual feats arise in subsequent sections, each seizing attention as it flits by. An audience member might be well satisfied simply to fixate on cataloging instances of sly wit. But to do so would be to downplay other elements of the work’s resounding success, not least the way Soper asserts her own stature: not as the star of the show, but as a nimble and resourceful participant among a group of equals. A magnetic presence and a musician who shifts among speech, lyrical singing, and extended techniques with virtuoso ease, Soper is generous in assigning her collaborators not only significant notes and lines to play, but also substantial roles to enact. In the work’s three duet segments, the players – Lesser in “Only the Words Themselves Mean What They Say,” Antonio in “The Crito,” Modney in “Cipher” – partner Soper with equal weight and presence. Where Soper’s dramaturgical vision ends and Tata’s begins is unclear, so I hesitate to ascribe stage actions and their subtexts entirely to one or the other. Better, instead, to say that Tata’s direction – and Anshuman Bhatia’s lighting, Brad Peterson’s projections, and Nina Vartanian’s costumes – all prove well suited to Soper’s penchant for mixing contemplative discourse and wry humor. “I came to language because I wanted to be explicit about things…and it became clear to me that the only way to do it was to use language,” Soper says, quoting Jenny Holzer, at the end of “Cipher,” the final segment of IPSA DIXIT. “People can understand you when you say…something.” One might add that when those words are used by someone as observant and resourceful as Soper, what results is an original, distinctive production that engages you instantly on contact, and then keeps you thinking, reflecting, admiring, and drawing new conclusions long after.